Family bach, fully furnished 2 story home with uninterupted stunning view of Mountains and Lake. High speed unlimited internet. Sky TV with movies and sport. Walk across the road to the lake shore and walking track to Queenstown and Frankton. Opposite bus stop. 5 mins drive to Queenstown, 2 mins to Frankton, 1/2 an hour to Remarkables and Coronet ski fields. Two bedroom plus loft (3) bedrooms with King bed, Queen bed (in loft) 2 bed Bunk and 2 separate beds in large upstairs bedroom. Three toilets and two bathrooms with showers. Large clawfoot bath with full running hot and cold water on deck with stunning views. Open plan downstairs with kitchen/lounge/dining area. Second small lounge area with ladder to loft bed. Fabulous local art on walls. Lots of heaters for winter and Logburner with wood supplied. Home is well set up with all mod cons including large plasma TV/DVD, two further TVs/DVDs in upstairs bedroom and smaller lounge for DVD watching and gaming. Sterio system. Childrens cot, highchair, pushchair and toys all available. Extra mattresses can be set up if required. Modern kitchen with dishwasher, fridge, brand new oven and cook top stove, microwave etc. Deck access from all doors, including French doors from main lounge. Wooden decks are childproof have large wooden table and chairs with great views and large gas barbque. Access to second story by carpeted stairs. Access to Loft bed by Wooden ladder (not suitable for young children or the elderly). This area is separated from main lounge by lockable door. Rae and Mark and their four children have enjoyed their holiday home since their children were babies. They stay several times a year and rent it out so other groups/family can enjoy it too. They fell in love with this property immediately and love the feel of the wooden walls and the cosy atmosphere. The views are stunning, ever changing and even better sitting in the outside bath. 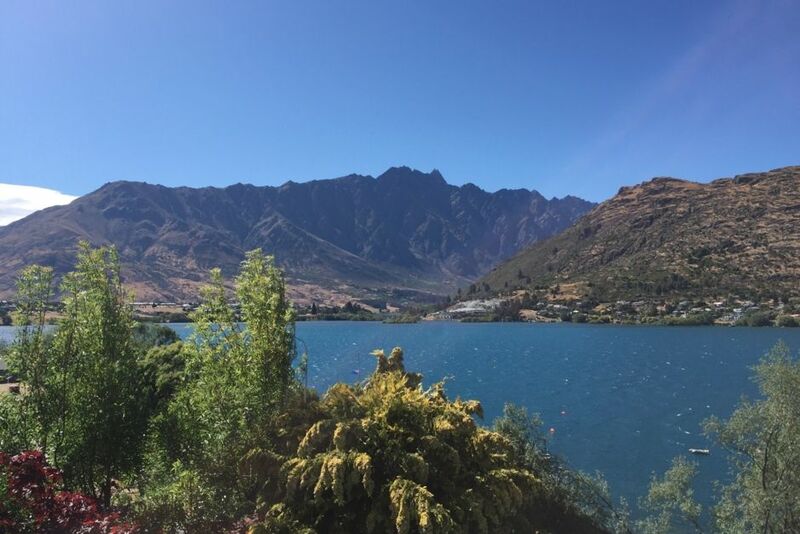 The house is just across the road from the Frankton-Queenstown track and Lake wakitipu, and easily accessed for biking and walking. It is also close to the 5 Mile shopping center and Remarkables Park for groceries etc. Beautiful unobstructed Lake Wakitipu views. Stunning views of The Remarkables. Sky TV with full movies and sport. Netflix capable (you need your own account). Most sought out location. Idealistic setting. Very understanding and cooperating hosts Mark n Rae. Clean, all provided, well located with wonderful views to lake Whakatipu. Thanks Mark n Rae for allowing us to stay at your property. Will always come back here if an opportunity arises in future. We stayed in this house for a week in Feb/March 2019. It's located between central Queenstown and Pak 'n' Save supermarket (approx. 5-10 minutes drive to each), which was perfect for us. It's also near the airport which is handy. The house itself is dated but comfortable, very clean and has good indoor/outdoor spaces. Being an aging timber house it was creaky and rickety at times but this didn't bother us. Rae and Mark were quick to respond to any queries we had. We would stay here again. Thanks for having us! overall, we were lucky to get such a sweet house and we enjoyed staying there. Nice and homely, plenty of beds for a large group. Thanks Rae and Mark! My family and I enjoyed our stay. It's just that when we arrived the kitchen was messy and 1 window in the kitchen was open. We thought the burglar went in so i sent pixs from the owner for proof but we did not receive any response. My family and i thought probably whoever clean the house forgot to close 1 window in the kitchen so ending up possum sneaked in and devoured the entire kitchen and left a messy kitchen. By the way , on our last day ,in our hurry to leave the house I left my fave pillow. But overall, the place was cosy and nice overlooking view of remarkables. Surely we will come back. Yes sorry about the window. We did ring you and left you a full message on your phone the day you arrived. But glad you enjoyed your stay.